While the rest of us surf the Internet, Russell Deaton explores ways to store its contents in a drop of liquid. Deaton, professor of computer science and computer engineering, along with his University of Arkansas College of Engineering collaborators Steve Tung and Jin-Woo Kim, and Junghuei Chen, a biochemist from the University of Delaware, is investigating methods of storing biological and non-biological information in a memory made of DNA (deoxyribonucleic acid) molecules. Essentially, they’re developing a DNA computer. The group is in the third year of a three-year, $699,000 grant from the National Science Foundation. Deaton admits the concept is on the edge, but the more he explains it, the more natural the whole idea seems. Further expanding computer technology, Leonard Adleman, often called the inventor of DNA computing, published the first article connecting DNA and computations in the journal Science in 1994. “To build a computer, only two things are really necessary; a method of storing information and a few simple operations for acting on that information,” he wrote. So eventually instead of laptops we’ll carry test tubes, right? 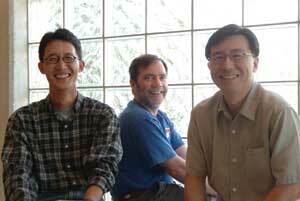 From left, Jin-Woo Kim, assistant professor of biological engineering, Russell Deaton, professor of computer science and computer engineering and Steve Tung, assistant professor of mechanical engineering, all work toward the same goal: creating a computer from DNA. Great, let’s go. Can’t wait to buy the newest gadget; a DNA memory device. Slow down, techster, they’re not going to be at Best Buy for a while. “Consider what we know about physics today, and we’re Newton with his apple,” Deaton said, shaking his head. “Modern electricity? We’re Ben Franklin with a kite. Cars? We’re not even Henry Ford, we’re inventing the wheel. Why are roughly 100 to 150 researchers in the world establishing the field of DNA computing at all? What’s the lure? Most important, what’s in it for us, the impatient computing public? And DNA computing promises the potential of much better ways to do exactly that. The possibility of storing vast amounts of data in a small space is probably the most alluring benefit of DNA computing. Think of how much information is stored in the individual DNA of every human. After all, you’re unique, just like the other six billion people on the planet. Indeed, the entire contents of the Internet actually could be stored in a drop of water. With great technological marvels have come great demands on the electrical supply. DNA computing offers the hope of a remarkably energy efficient machine, more than a million times more efficient than a PC. Adleman writes that in principle, one joule is sufficient for approximately 2 x 1019 ligation operations using DNA. Existing supercomputers now execute, at most, 109 operations per joule. Remember the last crime show you watched? The detectives probably used a tiny strand of hair or even an old sample of DNA to crack the case. Atraditional computer stores information as sequences of zeros and ones in memory, then manipulates that information with the operations available on the processor chip. Because most electronic computers operate on a sequential basis, they essentially perform tasks one at a time, albeit very quickly. DNA computers, however, offer a much more intriguing reality: massively parallel processing. In the cell, DNA is biochemically modified by a variety of enzymes, tiny protein machines that read and process DNA, manipulating it on the molecular level. Some enzymes, for example, cut DNA, and others paste it back together. Other enzymes function as copiers or repair units. We can now perform many of these cellular functions in the test tube. And in the test tube, these enzymes can work on many DNA molecules simultaneously. Which means DNA strands can produce billions of potential answers simultaneously, making DNA computers incredibly well-suited for solving problems that require searching for solutions among a massive number of possibilities. Imagine searching the Internet with one click, looking based on content instead of address. The research group also is exploring massive DNA memories that store and search information based upon meaning, or semantics. “The operations on DNA molecules occur in parallel, so searching and retrieving data based upon both content as well as context is possible,” said Chen, associate professor of biochemistry at the University of Delaware. A human DNA molecule is about a meter long and a twenty-millionth meter wide, or the width of 20 hydrogen atoms. The famous double helix shape is like a twisted ladder, and each rung is made up of four nucleotides adenine (A), thymine (T), cytosine (C) or guanine (G). The DNA code is then expressed in combinations of those letters. By mapping data onto sequences of nucleotides, information is stored in DNA. That information can then be retrieved by placing the Watson-Crick complement in the test tube. The Watson-Crick complement which replaces A with T and G with C then matches with the sequence representing the information you want. This base-pairing, template-matching reaction, which pairs up Watson-Crick complementary sequences, is called DNA hybridization. If the team can create a library of sequences that’s controllable, predictable and well-behaved, then instead of conducting an Internet search by address, you could eventually conduct an Internet search by both context and content. So DNA memory doesn’t work like the memory in your typical desktop computer, which stores information at specific addresses. Information is instead retrieved by content, or the DNA sequences that represent the information. Enter Jin-Woo Kim, assistant professor of biological engineering, who looks for the solution within solutions. Ensuring that the information in the DNA solution is absolutely correct is simply the starting point of Kim’s work. “How can we see what’s going on in the test tube?” asks Kim. The current method, gel electrophoresis, involves placing a solution of heterogenous DNA molecules on one end of a slab of gel and applying a current. The negatively-charged DNA molecules move toward the anode. Because shorter strands move quicker than longer ones, the DNA is separated by length. Using fluorescent dyes, a chemical wash and ultraviolet light, you can see bands in the gel where the DNA molecules of different lengths have come to rest. Kim also uses microarray technology, which involves putting a DNA sample on a slide, then adding another, using a chemical wash and then a high-resolution scanner to determine what’s happening. But this method has many disadvantages, as well. “It requires a very sophisticated, expensive and large machine,” said Kim. Steve Tung, assistant professor of mechanical engineering, spends his days building nanomachines and making them work. “My part of this research is building a platform for a DNA computer to operate,” he said. In other words, he’s developing a nanomachine to retrieve the information the other researchers are storing and searching. How big is a nanomachine, anyway? If you can spare one, pull a hair from your head (hey, no one ever said science didn’t hurt). A nanometer is about a thousandth of the width of your hair, or one billionth of a meter. Put another popular way, if we measured the earth in nanometers instead of meters, it would fit in a shot glass. Weird things happen with materials that small. This stickiness issue is quite, well, sticky. “The smaller the size, the more things stick together,” Tung explains. “Think of a golf ball on your car. If you drive away, it will come off. But think of particles of dust on your car. They stick to it. Whew. But one wonders a rather basic question: How do you engineer a machine too tiny to see without a microscope? But why use carbon nanotubes? “Carbon is inert and it’s solid,” said Tung. “It’s the vanilla of all the elements. You can change it to strawberry or tutti-frutti or rocky road. “Wouldn’t it be neat to design a computer out of a living thing?” thought Deaton as an undergrad in biology class. His interest was renewed after he read Adleman’s groundbreaking article as a professor. A recent $100,000 NSF grant, with Kim and John Lusth, associate professor, computer science and computer engineering, will help him pass along that interest to undergraduate students in the College of Engineering at the University of Arkansas.